A constant theme I noticed in regards to my viewings at this year's MIFF was that the large majority of films that I was anticipating, ultimately let me down, leaving me disappointed. It was not that they were all bad films, just that they did not live up to the expectations that I had put on them. 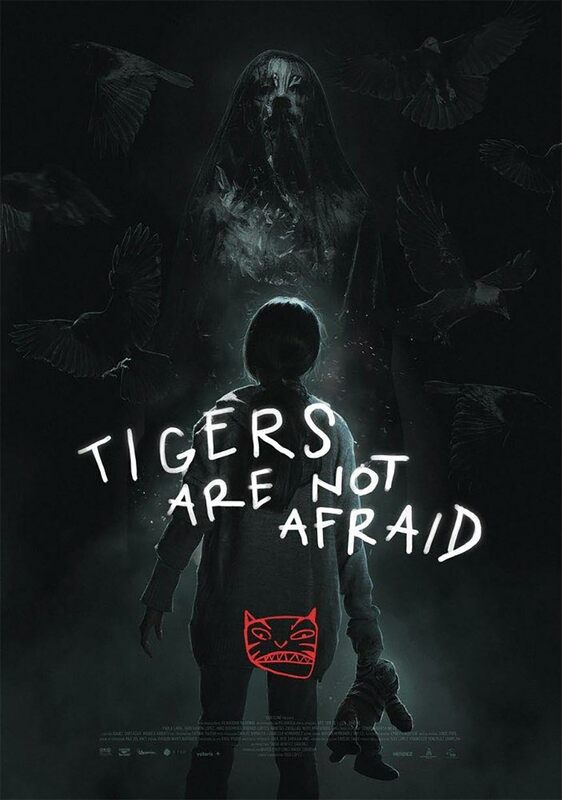 One film that not only lived up to my expectations but exceeded them was Issa Lopez's “Tigers Are Not Afraid”, a beautiful and horrific look at the Mexican drug cartels shown through the terrified eyes of a group of orphan children. Early reviews for “Tigers Are Not Afraid” all cited Guillermo del Toro's films as a point of reference and influence, particularly “Pan's Labyrinth”, due to the fact that both films deal with very violent realities and children using fairy tales as a means of coping with that reality. One afternoon, ten year old Estrella comes to the realisation that her mother has not returned home. After waiting at her home, hungry, scared and alone for two days, she makes the decision to leave her house and look for some food. While trying to stay hidden from the vicious Huascas cartel, Estrella runs into a gang of five orphan kids and although the gang's leader, Shine, is not impressed (seeing as she is a girl, thus bad luck), she becomes a member of this group. Together these homeless youths attempt to stay alive and safe from their harsh reality. One thing in their favour is that Estrella is in possession of three magical wishes, but in the brutal world these kids live in, does the saying “be careful what you wish for” hold extra meaning? WOW!! This film was amazing! At times it also feels like a brutal gut punch. This is a film that you feel in your bones. It is a film that will make you sick. It will move you. It will make you angry. The fact that we live in a world where some children have to live through the horrors of this film on a daily basis is just heartbreaking. “Tigers Are Not Afraid” opens in a manner that immediately sets the tone of the film to come with Estrella and her classmates learning about the power of fairy tales, when a violent and loud gunfight erupts just outside her classroom. What is terrifying about this scene is how quick all the kids and teachers drop to the floor and hide under their desks, showing that this is clearly not a one off, that this is something they are used to. It is here that in an effort to calm Estrella that her teacher gives her three pieces of chalk claiming that they are magical wishes. So right from the get-go we get the brutal reality of living in a world dominated by drug cartels, with the whimsy of the magic realism of the wishes, often read about in fairy tales. The ending of this scene is also chilling as we watch Estrella leave school and stare at the dead body in the street and not be affected by it. These kids have seen far too much already in their young lives. Director Issa Lopez has done the most wonderful job of depicting the world these kids live in and being true to it, while at the same time condemning it. This is an angry film. Lopez is clearly angry at the situation that currently exists in Mexico with the drug cartels and at the governments in charge there who are effectively doing nothing to see this situation come to an end. In fact, Lopez goes further than that in making it clear that the reason why the government does nothing is because they benefit more and are complicit to the cartels having ultimate power. With government officials being in bed with the cartels, it makes the police force useless and unable to act on any real problem, which is also highlighted in this film. While I obviously knew the problem in Mexico was bad, Lopez opened my eyes to a number of factors that I wasn't aware of, hadn't thought of or was blind to. The biggest of these was about the sheer number of children that are suddenly orphaned by the cartel violence, and these kids then being forced to fend for themselves, which ultimately leads them down a path of crime, and then the cycle continues. While the topic of the film is a dark one, and there are some very heavy scenes in the film, “Tigers Are Not Afraid” is not all doom and gloom, and that is because of the children themselves. These are children who have lost a lot of their childhood and are forced to grow up quickly because of it, but at the same time, they are still kids. As such, we regularly see the orphans playing with each other, making up games and just having fun. Each of the kids have their own personalities too, which adds to the flavor of the group. The two kids that the film mainly focuses on though are Estrella and Shine. When they first meet, they are at opposite ends of the spectrum with Estrella only just becoming orphaned and thus still has that sweetness attached to her; she isn't hardened yet. Shine, on the other hand, has lived on the streets for a while and trusts no one. He isn't someone that is easy to get to know or like, but this is due to the fact that he knows he can only count on himself to survive. The actors playing these roles are simply outstanding and make the film as great as it is. Paola Laura, who plays Estrella, has just the right amount of innocence to make her come across as slightly naïve but she also brings an inner strength to her that indicates she will likely have a chance to survive out on the streets. It is through her character that the audience sees this story and who we most likely relate to. We watch her being playful with the other kids but see her hardening as time goes on. Juan Ramon Lopez, who plays Shine, probably has the more complex role and excels beautifully. He is mesmerising on screen and so powerful. He is full of anger and emotion but keeps it bottled up always. While we never see him let his guard down and play with the other kids, his time with Estrella does soften him a bit as he exposes more of his personal pain. Speaking of pain, it should be fair warning that “Tigers Are Not Afraid” contains plenty of it. This is such a brutal film, filled with sickening violence. This is not the type of cool Hollywood violence, you feel every moment of the violence in this film and none of it is fun or cool. The fact that a lot of this violence is targeted at children means that this is a film that Hollywood would never have made, but this is another thing that I feel that Issa Lopez needs to be congratulated for. The fact that she did not tone this side of the film down, no matter how uncomfortable it may be, needs to be acknowledged. She has respected the reality of the world she is portraying and the film is more powerful for it. People die. Children die. It is ugly and it is bloody. This is both in the real world in Mexico at the moment and in the film. “Tigers Are Not Afraid” has one of the most shocking deaths of a child I have seen in a film for ages, since the “Noodles, I slipped” scene from Sergio Leone's “Once Upon A Time In America”. To be honest, I am not sure if the scene in question is graphically violent or not, but emotionally, it just knocked every bit of air I had within me. I didn't see it coming and I felt it all and it was painful. 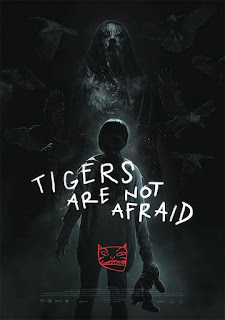 While I have mostly talked about the real side of “Tigers Are Not Afraid”, I think it is time I talked about the fantasy and fairy tale elements to this film which are also handled with the lightest of touches. While I agree that “Pan's Labyrinth” is a good film to compare this with, the fairy tale elements here are not as large as that film. The majority of it revolves around Estrella's three wishes. The interesting thing about these wishes are that they never go the way Estrella imagines when she makes the wish. Her first wish (which is not really a spoiler since it happens so early in the film) is that she wishes that her mother would return to her. Her wish comes true, but since her mother has been killed, she returns as a ghost wrapped head to toe in plastic. It is an image that obviously terrifies the poor girl, not to mention that she has her mother's voice whispering in her ear the whole time now. From then on, Estrella is reticent to use the wishes but when she does, it is for reasons of good but they never turn out that way. Her third and final wish, and the result from it........wow! I had to pick up my jaw from the floor. While these wishes are used for Estrella to help cope in this world, it is as if director Lopez is saying that there are no magical wishes that can save you, you just need to come to terms with your own reality and survive, which is a sentiment that is actually echoed by Shine to her at one point. Some other instances of magical realism that show up in the film are when one of the orphan's soft tiger toy comes to life, a dragon imprint on a phone breaks free and flies away, and a snake from a tattoo comes to life. These are handled by some so-so cgi. I thought the tiger toy was very well done, but the snake was a bit of a dud. Overall, “Tigers Are Not Afraid” was a film that I adored. It was not an easy film to watch, at times it is not an easy film to enjoy, but it is a story that needed telling and was told in the most beautiful and horrific manner imaginable. It was such a powerful and painful experience, that moved me considerably. It is a film that makes you angry but it also gives a voice to the people from beyond the grave screaming for all this madness to STOP! I have attempted to keep as many details of this film as vague as possible (or not mentioned them at all) so viewers who end up seeing this film, get to watch it as unspoiled as possible. It is a stunning achievement from director Issa Lopez (and all else involved), and it was my favourite film from this year's MIFF.